This is pretty cool: so there is an article in The New Yorker which explains a new procedure known as soul removal. For a fee, people come in, painlessly have their soul extracted and, if the results are positive, they live life with no worries or troubles. Paul Giamatti plays an actor named… Paul Giamatti (bear with me), who hesitantly decides to get the procedure done by zany Dr. Flintstein (David Strathairn, miles away from his Edward R. Murrow in Good Night and Good Luck). 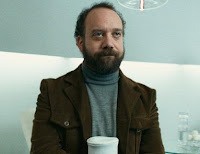 Once it’s done, Giamatti feels better, sure, but he’s lost that fire that gives his stage acting so much allure. Soon he tries the even newer procedure of soul replacement, where one temporarily takes the soul of another. I’m making this sound like a hyper sci-fi film where people inhabit other people’s bodies. It isn’t like that. Once you have someone’s soul, you inhabit only small details of what the original person had. There are no exorcisms involved, only a few confusing dreams. The conflict comes when we discover that Russians traffic the souls using “soul moles” to transport the souls between the countries. The Russians can sell them for big, so they make a scary profit. French director Sophie Barthes most have Charlie Kaufman embedded in her subconscious as this film is a reflection of both Being John Malkovich and Eternal Sunshine of the Spotless Mind. While the film is beautifully shot, it is clearly the work of a new filmmaker, one who’s a little rusty with her editing cuts. Rusty, maybe, but a director to look out for, definitely.